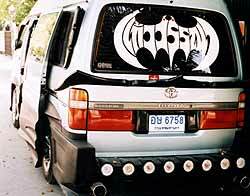 Spotted this incredible make-over of a Toyota Hilux van in Soi 5 the other day. It has black rubber wings and things all over it, and as I walked towards it I began thinking that it was some sort of batmobile joke. When I looked at the back window, I realized it was no joke! Avoid it like the plague! Anyone who could drive this vehicle is mentally questionable. Last week, I mentioned that Noel Westwood and G.L. Davies circumnavigated a very large island by car in 1925. It took almost five months. I asked what was the car? Well, the island was Australia and the car was a Citroen 5CV. Not bad for 1925! Who said that Citroens weren’t reliable? So to this week. Hands up all those who remember the Invicta marque? 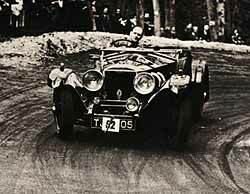 The Invictas were interesting sporting machines, with the fastest having four and a half inches of ground clearance. Rather too low for today, and definitely too low in the 1930’s when they were in their heyday. The push behind the marque was Lord Macklin (who I think was the father of British racing driver Lance Macklin). In the late 1920’s an energetic young lady by the name of Violet Corderey drove an Invicta around the world and set the world 25,000 km record at 89 kph, a real piece of autotrivia! However, the S type Invictas were well built vehicles with all sorts of innovative features, such as a dual fuel feed system, using air pressure or electric pump, and telescopic shock absorbers all round. They had one other very innovative feature that related to the positioning of the starter switch. So after all that verbiage above, this week’s question is simply that - where was the switch? Now try and Google that one! Automotive News sent me advance notice of their world congress which will be held in the Hyatt Regency Dearborn, Dearborn, Michigan, USA. This will run from January 17-20, 2005. If you are hot to trot, the cost is USD 1,395 for the early registration fee by Nov. 24; $1,595 after Nov. 26 or a daily fee of $850. (Mr. Editor please note, that’s only 55,800 baht if you get me in quick.) For information: autonews.com/2005worldcongress or Call (734) 929-0498, or toll free at (866) 374-6227. Speakers at this world conference will include Ford Motor Co.’s human resources chief Joe Laymon and Bernd Bohr the head of Robert Bosch GmbH’s global automotive group. Joe Laymon has been Ford’s group vice president for corporate human resources and labor affairs since October 2003. He joined Ford in 2000 as executive director of human resources and helped repair employee discord caused by an ill-fated grading system for salaried workers. Prior to joining Ford, Laymon was director of human resources for Eastman Kodak’s Canadian operations and chief labor negotiator for Xerox Corp. He will address the congress Tuesday, Jan. 18. Bernd Bohr took over the Bosch’s automotive operations in 2003. He previously ran Bosch’s braking systems division. Bosch ranks No. 2 on the Automotive News list of the top 100 global suppliers with more than USD 23 billion in OEM parts sales in 2003. Bohr’s ambit is to boost the popularity of diesel engines in the United States and he will speak on Wednesday, Jan. 19. While the 55,800 baht registration is a little too steep for this little black duck, this congress will have the auto heavyweights of the world there. The future direction for the automakers will be mapped out at this event. What did we learn from the final Grand Prix of 2004? Well, we learned that even seven times world champ Michael Schumacher can get it wrong in practice and end up world chump, and it was a very subdued Schumi who had to use the spare car, qualifying 8th and then penalized 10 grid spots as well, to start 18th, down in Minardi country. However, he had made up eight spots on the first lap, and despite another spin, finished in the points in 7th place. Poor Ruby Baby is still waiting to win his home GP, and didn’t manage it again, despite starting from pole position. We also saw that Christian Klien doesn’t seem to understand how to let faster cars pass ‘cleanly’ if you’ll pardon the pun. His debut year has seen him collide with Schumi (twice), Coulthard (twice), Webber (twice) and a few others as well. The words he uses are always the same, “I saw him coming but didn’t think he would come up so fast!” That’s why we won’t see the young Austrian again next year (unless he buys a drive with Jordan). Jaguar even admitted during the year that he was not making the grade as a driver, even though his sack of gold was large enough. Talking about large sacks, Juan Pablo Montoya showed that he has the fire and the skill to do the job, he just needs encouragement from his team. I feel he didn’t get that from BMW Williams. 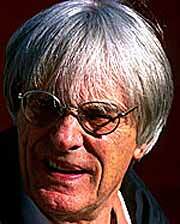 But will he get it from McLaren next year when he lines up alongside Raikkonen, the apple of Ron Dennis’ eye? I somehow doubt it, though Ron is already saying that McLaren has the environment to help Montoya. And when I write about driving alongside Raikkonen brings me to another fact we learned from Brazil. Laughing boy Kimi Raikkonen wears blinkers, driving down the pit lane side by side with Montoya, and saying afterwards that he didn’t see him there. They only drove for 50 metres less than 300 mm apart! The stewards of the meeting were not impressed with his explanation, and laughing boy was fined $10,000. So we now go into the ‘lay off’ season. The rules for 2005 are still not cast in stone, the teams are not happy, the engine suppliers are not happy, several circuits are not happy and several drivers ditto. While Ferrari and McLaren have their line up signed up (Schumi and Barichello in red, Montoya and Raikkonen in silver), there are many others who have yet to announce their pairings. BMW Williams, having lost the Jenson Button Contract Review Board fiasco, are yet to say who will partner Mark Webber, and Minardi and Jordan are shaking their donation tins to see who is willing to tip in the most. I have spoken before on ‘pay drivers’ and how these lower teams need drivers with real talent to get their cars further up the grid, but ‘real talent’ doesn’t pay for the privilege to drive. While Minardi and Jordan continue to look for ‘pay drivers’ they will continue to bring in the likes of Alex Yoong to fill the rear of the grid, and will not improve their own chances at getting further up that grid. As the teams finalize their driver line-up, as the FIA finalizes the regulations, and Bernie Ecclestone finishes counting his money, I will keep you informed. Spotted this one outside the Marriott, parked where you and I would have received a barrage of angry whistles and told to move on. This is a cool 26.5 million baht of Ferrari F575 M Maranello. To be quite candid, I found the styling to be very bland, and from the side looked like a scaled down early 70’s Mach 1 Mustang with the hip-line kick-up over the rear wheels, or even at a stretch the old 275 LM. You would have to be a real Ferrari fan to get one of these, even with its 515 bhp from the 5.7 litre V12. The brakes actually looked to me to be quite small when you take into consideration the potential top speed and performance. The 575 M Maranello is one of the latest models produced by Ferrari (released in 2002) and is an evolution of the 550 Maranello. The 575, refers to its increase in engine capacity from 5500 cc to around 5750 cc, which has resulted in increased power and torque. The letter ‘M’ stands for ‘Modified’, to make you believe that every part of the car is modified vis-เ-vis the 550 Maranello. The first obvious change is the fact that Ferrari have done away with the console gearshift, and you get one of Schumi’s paddle shifts on the steering wheel, like a real F1 car. That may impress some, but since you can get it on a Honda Jazz, I remain underwhelmed. According to the factory, the principal modifications were limited to those required to deal with the technical changes: in particular different shape and size for the air intakes in the new front end of the car and a new treatment for the front spoiler. The headlights and wheels have also been modified. Wow! Almost a total makeover! Ferrari claim a 50-50 split between the front and rear axles, with the driver on board, thanks to a transaxle design which features a combined rear mounted gearbox and differential unit with conical torque and autolocking differential in the same unit. It has an adaptive suspension with different settings, based on a system of independently controlled damping at all four corners of the car. The system is capable of selecting the ideal ride height for any condition, with two choices: Sport, which is selected for a more sporty ride, improving traction and Comfort, which gives a more comfortable ride, absorbing road bumps. Hopefully there is a third choice called “Thailand Roads”, which will give 600 mm of ground clearance to allow you to traverse any of the 13 million roadworks projects between Chiang Rai and Phuket. Jokes aside, it certainly is a very advanced car technically, but I still say you have to be a very well heeled dyed in the wool Schumi fan to slap down 26.5 million baht so that you can park the thing where lesser mortals in Daihatsu Miras can’t go!